School Nativity – Do You Need Some Help Choosing A Nativity Script? Inclusion is very important to me. All of my scripts are highly adaptable and flexible enough to be changed to suit your own needs, so please see the script previews if you want to get a better feel of any individual script as I have no doubt that you will find inventive ways to use any of my scripts. The ones that I have listed below are those that I personally consider to be the most obvious choices for the reasons given. I genuinely am here as your enabler, so if you have any specific special needs that you would like help accommodating just email me and I will do my best to supply a solution, in rhyme and rhythm, in keeping with the script. My favourite request to date was for a means of including identical twins in the role of Mary, which I did by writing a humorous handover moment between the two. I can’t promise to achieve, but, time allowing, I will always do my best! The Alphabet Nativity Play : This is a very visual script and, whilst the nativity story is narrated, the script doesn’t rely entirely upon the narration. It is written as an alphabet poem which includes 26 alphabetical key words, each represented by an illustrated letter which is displayed when the keyword is mentioned in the narration, and actions are included for the children to do to represent the word. The story can be ‘walked through’ by actors but without any speaking parts, although the songs offer opportunities for character solos if you choose to use them in that way. There is also an option (which I highly recommend) of including an ‘Instructor’ who interacts with the audience and an ‘Action Superstar’ who demonstrates each of the actions to the 26 keywords mentioned during the story. The Instructor’s (optional) interaction with the audience adds a unique and fun element to the play, making it a great way to include everyone. The Instructor, a sort of pantomime style character, holds signs up for the audience (or you might choose to use the rest of the children/choir etc) to say (‘NO’, ‘AH!’ ‘SH’ etc). In true pantomime style, the response isn’t good enough and the Instructor, also using rhyme and rhythm, tells them so (eg, “That really isn’t good enough…let’s have another ‘ah!’ Remember, he’s the cutest baby that you’ve seen by far!”) Likewise, the Action Superstar demonstrates the actions throughout the play with the option of getting everyone to do the actions together at speed to a recap poem at the end of the play. The Story of Christmas : some of the parts are written to be spoken from seats in the audience, without any walk on acting required. All of the parts have script prompt cards provided and any actors lines can be omitted (and substituted by the narrator) making it…. Great for involving those who can’t commit to any rehearsals, or even to being present on the day. Ideal for including the hearing or vision impaired and the disabled, as some of the parts are conducted from a seat at the end of a row (Innkeepers who simply answer their door to speak when Joseph and Mary approach) This means that their prompter literally approaches them as they sit in a seat with the audience. This script is therefore ideal for young children or those with memory problems, as nothing needs to be remembered, although they do need to pay attention to the instructor in the play to listen for their instructions. This is, however, made easier by the fact that the instructions are given by the ‘Instructor’ not the narrator. All of my scripts, by using rhyme and rhythm and short speaking parts, make it more feasible for non-confident readers to take part knowing that the lines take very little memorising. All of my songs are deliberately simple and repetitive, using familiar children’s tunes with my own Christmas lyrics added, making them easy for the children to pick up and remember without relying on reading any words. The following are generally scripted for an cast of 22 to 25 small speaking parts, and characters can be added in or removed without affecting the length of the script or the performance time. (Suggestions are provided for you.) There are, of course, always opportunities to add in extra non-speaking parts (innkeepers wives, animals, extra shepherds, kings, angels etc) and the songs provide an opportunity to include children as a choir. I always aim to make my songs simple and effective to minimise rehearsals and make them easy to remember for young children. The Day That Baby Jesus Came to Town (With lots of humour, told from the perspective of the Innkeeper’s gossiping wife using her diary) The Innkeeper, his wife and the narrator carry the play and must be good, confident readers so this is ideal for older junior children. Whilst the have the bulk of the lines between them, they do not need to remember them as they pass the innkeeper’s wife’s diary around and read from it, so this is provided as a script prompt for them to scan read. The script is full of opportunities for sarcasm, attitude and lots of humour, together with lots smaller speaking parts for younger children, opportunities for your own extra non-speaking parts and 6 simple and effective songs for a larger choir to sing. The Donkey’s Christmas Play (Cute and amusing , focusing on the donkey as the main character, and sharing a lovely message of humility, and of God always been there with us) With 23 small speaking parts already included and the option of adding your own extras there are lots of opportunities to make everyone feel special. A young child playing the donkey will give it cute appeal, or an older child could shine with their comic acting skills. The 6 songs included are a chance to include the whole school as a choir. The Alphabet Nativity Play is also an option but with actions as it’s focus instead of speaking parts. The narrator reads the story (which is in the form of an Alphabet Poem) and highlights 26 keywords in alphabetical order. When the keywords are mentioned, pictures are displayed and actions done for each word. The play can be enacted in mime as the story is narrated if you choose to do so. Meanwhile, there is the option (not essential) of some interaction with the audience in the form of an ‘Instructor’, a sort of pantomime style character who speaks to the audience and holds up signs for them to say in response. 9 simple songs are included which also offer the opportunity of solo parts if you choose to use them to enact the scene. Hence, the play can involve large groups of children doing actions, songs and potentially walk on parts to enact the narration without saying lines, so is particularly good for special needs groups, etc. Scripts without music, intended for you to use your own or for you to include hymns/carols (maybe even for your audience to join in with) some of which are suggested but not provided for you. The Simplest Nativity Play Ever The fastest selling script, with the most overwhelming feedback to date (19 speaking parts plus narrators, instructor, angels and non-speaking extras as required) The narrator tells the story in such a way that every speaking part is introduced with an obvious prompt such as “The innkeeper listened while Joseph said…….” and script prompt cards are provided to make the distribution of lines easier. To make this a whole school performance you would need to provide your own songs to include a choir. The Story of Christmas NEW FOR 2016 and using the same concept as The Simplest Nativity Play Ever as a result of the fantastic response to that script and requests for something similar. (Up to 21 speaking parts plus narrator, on-stage director, bible reader and ‘host’ of angels) This script has an on-stage director (must be an older confident reader as they constantly refer to their script as if making notes, when they are really scan reading to save memorising it). This person can literally direct on stage as part of the play, even taking actors by the hand to guide them, so it makes it very feasible to mix older and younger children as any ‘oops’ moments can seem natural! 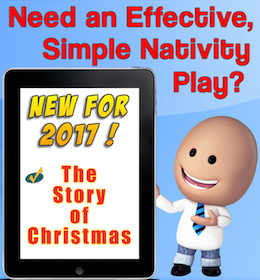 The Simplest Nativity Play Ever (19 optional speaking parts plus angels, narrators, instructor and non-speaking extras as required) All children can either mime to narration, or can say their own line if preferred. The script itself includes an instructor as an extra narrator, who literally tells the actors what to do and when to do it as part of the script. No songs are included so that you can use your own favourites, or even include carols for everyone to join in. The Day that Baby Jesus Came To Town The nativity story is told from the perspective of the gossiping Innkeeper’s wife using her diary as a point of reference (and therefore meaning that the script does not need learning). There is lots of humour, sarcasm and attitude included (with Mary and Joseph’s relationship especially), offering a great opportunity for the main characters to shine as comic actors. This is a really fun script for the actors and the audience and is very much enjoyed by this age group. The Alphabet Nativity play is narrated entirely as an alphabet poem, whilst 26 illustrated letters are displayed to represent the key alphabetical words that are stressed in the story. This can be done without any acting at all using the letters as a simple visual representation of the story being told, making this a totally unique nativity, with the option of actors walking through the story as it is told. There is also an optional ‘Action Superstar’ who can demonstrate the appropriate actions to each of the keywords, and the fun option of getting the whole audience (or another group of children) to participate in doing the actions at speed at the end of the play when a recap poem is read out. A particular favourite optional element for this age group is the Instructor, who interacts with the audience in a pantomime style, getting them to respond as appropriate to elements of the story. Whilst the songs that are included are geared to involving the younger children, the play can be shortened to include no songs, or carols can be used for the cast and/or audience to sing. The Children’s Nativity Story is a simple retelling of the bible based nativity and includes some gentle humour and opportunities for solos in the Shepherd’s Calypso, although some of the songs may be considered more suitable for younger children. The Donkey’s Christmas is told from the perspective of the donkey on his way to Bethlehem as he grumbles about his humble role in life “No-one seems to notice me, no-one seems to care. I’m tired and I’ve had to walk right from over there”. This can have a really endearing effect when acted by a young child, but an older child can add attitude and humour throughout the play until the realisation at the end that he had the most important role of all in carrying God’s unborn son. The songs, whilst using simple familiar children’s tunes, do offer an opportunity for groups to sing as part of the play, such as the kings, the angels, and the shepherds. I plan to write more scripts that approach the story in a unique way specific to this age group, and continue to add them in the near future. In the meantime, all of my scripts lend themselves to being used by a mixed age cast. 2…..some of my scripts include songs using familiar children’s tunes to which I have added my own nativity based lyrics, making them easily remembered and minimising rehearsal. Better still, none of the scripts are reliant on the songs that I have included so this element of rehearsal can be cut out completely if you use hymns/carols for the audience to sing at the appropriate points in the script, or minimised by using your own familiar favourites. The Simplest Nativity Play Ever is exactly what it says. It could be performed with a cast that has literally just been gathered together an hour before and given their script prompt cards, without rehearsal! The narrator tells the bible based nativity story, and includes obvious prompts for the actors to speak, such as “the innkeeper listened as Joseph said…….” (“Do you have a room with a lovely warm bed?”) etc. This means that the actors know when to speak but, if they choose not to have a speaking part, or forget to speak, or simply have stage fright, the narrator can carry on interrupted with the story and say their lines as part of it. Printable script prompt cards are included to be distributed to the cast, and these can be used for the performance if necessary. Better still, the script includes the role of an Instructor who literally tells each character what to do and where to go at the appropriate point (all in rhyme and rhythm in keeping with the script), making rehearsal of even the direction part of the script unnecessary. The Story of Christmas NEW FOR 2016 Written as a result of the incredible feedback from the Simplest Nativity Play Ever, this uses the same concept of not requiring a rehearsal, but uses a (scripted) on-stage director to give instructions to the cast, some of whom never even need to leave their seats to be involved. (Director needs to be confident and able to scan read as they refer to the script throughout just as a director does, but disguise the fact that they are reading their lines from it!) An example diagram of the layout of the church when I used it personally is included, to help you to visualise it and to avoid overlooking elements such as props being in place. The Alphabet Nativity Play can be as simple as you choose to make it, and can be used with or without acting, yet has a creative alphabetical visual element. The songs are very simple and intended for the younger children to perform, or you could simply include Christmas carols for the audience to join in. There is an optional character included (the ‘Instructor’) who gets the interacts with the audience ‘pantomime style’ by holding up signs of responses they are expected to say. Also, 26 alphabetical keywords are specified during the story and actions are suggested to do for the words, with an optional “Action Superstar” demonstrating these and an option for everyone to join in at speed to the quick recap poem at the end of the play; a really fun moment. In theory, this script should be simple, but in practice the ‘Action Superstar’ and the people holding up the illustrated keywords need a good familiarity of the script to get their timing right and in sync with the narrator. Don’t underestimate this element of it when you plan rehearsals! In general, the rehearsal time is more specific to the practicalities of the script (ie, timing, plus where and how to display the letters.) but if you choose to use the Instructor and get the children to respond, and/or the Action Superstar and get the children to copy the actions, this would be the main aspect of group rehearsals. The following scripts are purpose written (all in rhyme and rhythm) for this exact situation and can be used with little group rehearsal, using script prompts which are included with the script ready for you to print off and distribute to any of the cast who choose to say their own lines. If anyone prefers not to say their own lines, they can act as a walk on part and their lines be allocated to the narrator or a voice-over so the script continues seamlessly. The Simplest Nativity Play Ever : The narrator tells the bible based nativity story with obvious prompts for individuals to say lines such as “The innkeeper listened while Joseph said….” (Do you have a room and a lovely warm bed). An instructor tells the actors what to do (all in rhyme and rhythm) so that the direction needs little rehearsal. The actors can literally read their lines from script prompt cards that are provided ready for you to simply print off on card, and distribute. The Story of Christmas: The play is directed by an on-stage director who literally gives the instructions as part of the play (all in rhyme and rhythm), whilst constantly referring to his script as if making/reading notes, when he is actually scan reading his own lines discreetly. This therefore requires a confident director who is actually leading the play itself, but everyone else just responds to the obvious prompts such as “This is the angel who told of the birth of Jesus, the Saviour of all of the earth” and then reads their lines from the script prompt cards that are provided. If they choose not to say their own lines a voice-over can say them (this is written into the script). This script also offers the opportunity to involve some of the audience with lines to say from their seats, which would make a simple way to involve children with speaking parts without them even needing to leave their class group. The Alphabet Nativity : This play is less about acting and more about telling the story with visuals. Hence, 26 key words are included in the story, which is told as an alphabet poem, and as each of them is said (in alphabetical order in the story:A=Angel, B=Beginning of the story, C=Census, D=Donkey etc), an illustrated letter is displayed and the appropriate action is done for that specific keyword. The illustrations act as a prompt for the appropriate actions. These letters are all prepared and ready to be printed onto card, and this is all the preparation time that you would need as there are no lines to distribute to the children, with the exception of the narration and the songs. Of course, if you choose to have the story mimed to the narration, you will, of course, need to organise costumes. The above scripts use congregational hymns/ carols of your own choice, so no music rehearsals are required. All of my scripts are deliberately balanced to include lots of small speaking parts (generally 19 to 25) but are deliberately adaptable so that you can reduce or increase the cast, but some are more flexible than others in terms of omitting certain lines to accommodate anyone shy in your cast who doesn’t want lines. The Donkey’s Christmas play : The story of the birth of Jesus told from the humble perspective of a donkey who feels unloved and unnoticed until he realises that God actually chose him to carry His unborn son to his place of birth! A lovely, cute play with a strong message of humility and importance blended together. Optional songs are included. The Day That Baby Jesus Came to Town The innkeeper’s gossiping wife tells the story of the birth of a special baby in her stable, with the help of her diary which gets passed round as the characters interact and comment on her inaccurate memories! Hence, the diary is actually the script so there is no memorising to do, just an ability to scan read and act without it being noticeable. I would consider the main characters of this script to be better suited to older children. Scripted with 19 small speaking parts (many optional) it tells the traditional, bible based nativity story all in rhyme, with narration, and with lots of fun and humour. Scripted with 20 small speaking parts (many optional), the narration and acting is all in rhyme, whilst Grandpa introduces each scene by reading from his ‘book.’ Santa/St Nicholas can (optional) be included, with a reminder of the real meaning of Christmas. Written from the perspective of the gossiping Innkeeper’s Wife, who was so intrigued by the activity and visitors at the stable that night that she wrote it all in her diary. Together with her downtrodden husband and the narrators, the story is told in rhyme (reading from her diary) whilst being acted out by another 20 scripted small speaking parts (many optional.) Mary’s uniquely amusing dialogue brings an extra touch of humour.